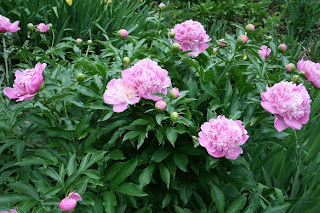 Amy's Creative Pursuits: The Late Spring Garden: Peonies! Hi all! 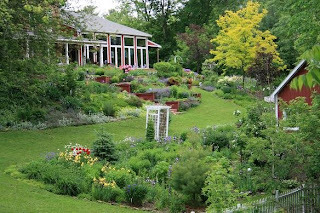 Welcome to Day Two of my Late Spring Garden Tour. Today I am featuring Peonies. 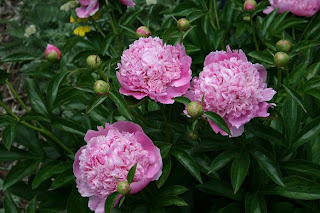 I have many, many different varieties of peonies but I am only showing photographs of the plants currently in bloom. Some of the Peonies have bloomed already, and some are still currently waiting to bloom. The first picture is a far away shot of my garden from my neighbor's viewpoint. Aren't they the lucky ones to be able to look at such beauty everyday and not do one lick of work? LOL! Actually, they have a beautiful garden too, and I take advantage of that view too! 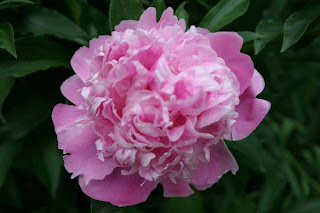 The second and third pictures are of one of my many light pink peony plants. I'm sorry I don't have the 'official' name of any of my plants. I have long since forgotten them. I know that's bad for a gardener, but I have too many other things to do other than record plant species names! LOL! 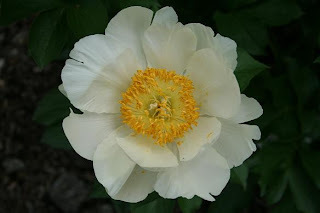 This is a rare white peony. I absolutely love it! Here is one of my favorite peonies. In this picture its actually past bloom, after the wind and rain got to it. Its absolutely gorgeous when it is in full bloom and in all its glory. 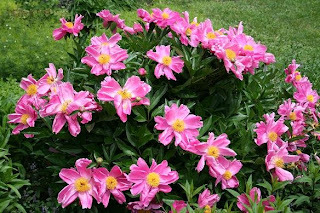 The bush is just covered with gorgeous pink blooms and yellow centers. 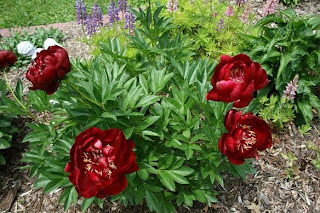 I searched forever trying to find a dark red/burgundy peony and I finally found this one. Isn't it a beauty? And finally, the peony in the last picture is somewhere between a pink and red in real life. Absolutely gorgeous! I just love peonies. Now if only I could figure out how to cut them and bring them in the house without bringing all the ants in with them. Does anyone have any ideas? I've tried shaking them upside down, spraying them with a garden hose, submersing them in water....nothing works. The ants still come in with the flowers. I'm floored by how extensive and gorgeous your garden is. I have lots of beds myself but I cant' seem to find things that grow well or bloom when they should. I wish I had your green thumb. The peonies are really pretty. I especially like the red one. I've never seen that color before. I just LOVE your garden tours Amy!! Your peonies are gorgeous!! I have 3 plants ... each one different from the other but all in the pink & white variety! Your red plant is AWESOME ... wow .. I don't think I've ever seen a red peonie!! I like your favorite one too ... absolutely gorgeous ... thanks so much for sharing!! Your garden is so beautiful and I have to admit I am a bit envious! You must have a huge green thumb in assition to your card-making talent. I spent 5 hours weeding yesterday, my back is killing me and my garden is still a mess. That will teach me to start so late in the season;). Your peony's are stunning! I wished you lived closer to me and I could have you come do my gardens!! beautiful! i just wish i could smell those peonies! Amy your garden is incredible. I am in utter amazement here. This is fabulous. Your peonies are so pretty. I love them. Thanks for sharing.